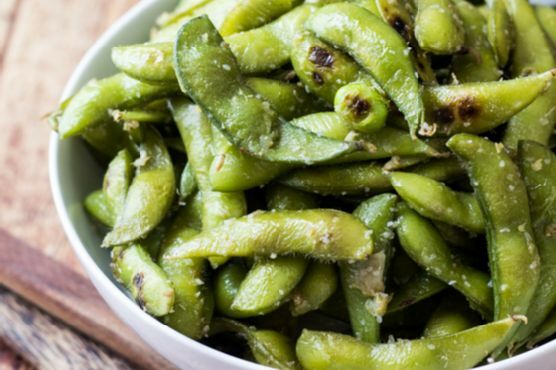 Boil edamame according to package directions. Drain and set aside.Meanwhile, heat the olive oil in a large pan over medium-high heat. Transfer drained edamame to the hot pan and saute 3 to 5 minutes, letting the pods get brown on both sides. Add grated garlic and ginger to the pan and toss well to coat. Turn off the heat and continue tossing the beans for 2 minutes. Transfer beans to a large bowl and let cool for ten minutes. Toss with salt according to taste. Serve warm, with an extra bowl for the empty pods.